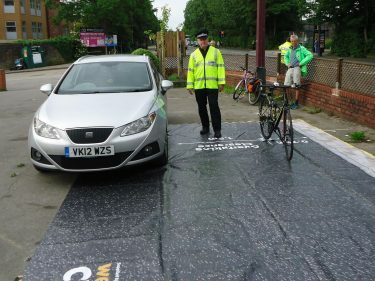 The Bristol Road Justice Group met senior Avon and Somerset Police officers at the beginning of June to discuss ongoing concerns as to police road traffic law enforcement and other work to reduce the dangers posed to cyclists by dangerous driving. The meeting was timely following the publication last month of the detailed report ‘Our Lawless Roads‘ from the national road victims’ charity RoadPeace, which reports an alarming drop in traffic law enforcement and in traffic policing numbers (a 60% reduction in Avon and Somerset from 157 to 62 officers). Here’s the view of Cycling UK on this important report. Recording of incidents – police are still looking into why the number of incidents of injury to vulnerable road users which they record is lower than the number admitted to hospital. Their main concern is making sure those that are reported are investigated thoroughly. We also raised our concern that the severity of injuries is under-recorded and Kevan Rowlands said he would spot check a sample to see whether this was the case. Near miss and collision reporting – shortages of IT support mean that it is still not possible to report cycling collisions via A&SP’s website. Kevan Rowlands would also like to revise the near miss reporting facility to make it easier for the police the extract useful intelligence. He hopes that they will be able to move towards sending letters and leaflets to drivers who have been reported for close passing. Mobile phones and close passing – police aren’t planning any proactive work around mobile phone use while driving but will link up with national initiatives. Have trialled two locations for close pass work – plain-clothes officers on bikes with cameras have alerted colleagues further down the road of close passing motorists who have then been pulled in, checked over and given advice as to safe passing. Cycle cam footage – Kevan Rowlands confirmed that the police will accept and check footage from the public. Can be emailed but would prefer that it is brought to a police station and checked on the spot. Prosecution of dangerous drivers – we again pressed the police on the low level of prosecutions. Kevan Rowlands’s view was that prosecutions were very time-consuming and not convinced how effective or appropriate they were. Preferred “non-court disposal” of cases e.g. attendance on training courses. While we agree that prosecution might not always be appropriate we are concerned that sometimes victims are left with a real sense of injustice when dangerous drivers are allowed to apologise and drive off and they, the victims, have to suffer the result of the drivers’ negligence, sometimes over many months or even years. The police have a new app – and very good it seems too. Allows them to plot incidents, near miss reports, speeding offences etc and identify trends, clusters of types of incidents and direct their resources. 20 mph – Kevan Rowlands said he thought that the police were now broadly supportive of 20 mph and didn’t see Bristol changing its overall policy. In all, a useful and constructive meeting. Disappointment at the police’s reluctance to prosecute dangerous drivers alongside other measures, but good to see that at last they seem to be developing much better systems to identify the location and types of bad driving and are committed to direct their resources accordingly.